All the time, often in the foreground and always in the background of global affairs, there is the East meets West fault line that runs through the Middle East. I thought it might be helpful to have a country by country review of how each contending country stands. Such a review, for reasons of space and time, would not be exhaustive. It will not be in-depth and is certain to contain errors. I am not all-seeing and the degree of attention I pay varies greatly from country to country. On top of this, add the following factors to the shaky nature of some of this blog’s contents: firstly, the situation is continuously changing, secondly, the most important developments take place behind closed doors and thirdly, a humongous quantity of fake news and misleading propaganda is being generated by both East and West and is added to by the countries that are victim of their meddling. It is a fairly safe assumption that any view generally held in the western world is at best inaccurate and incomplete and at worst, founded on grossly and deliberately misleading, self-serving information generated by western intelligence agencies and the American corpratocracy. And then there are the sins of omission: the news that is ignored and never reported. As a hint, should I go to Google to get the latest news from the Syrian front line, I spare scarcely a glance for the first page that comes up. It is in the later pages, containing the less popular hyperlinks, where more accurate, and often more recent, reports are likely to be found. Some of the national positions outlined below are ambiguous and arguable, but for convenience I have allotted positions in the spectrum of allegiance as best I can. In the blue corner we have the USA and in the red, Russia. There are approx. thirty countries involved in this macabre dance of folly. The subject is far too extensive to be dealt with in a single blog, but over time, I will keep coming back to the list and trying to fill in more detail. The blue corner: the USA’s allies and allies of allies, in order of declining commitment are: Israel, the UK, United Arab Emirates, Saudi Arabia, France, other NATO countries – such as Germany and Belgium, Jordan, Egypt, Mali, Morocco, Tunisia. Those striving for neutrality between the camps are: Iraq, Lebanon, Muscat & Oman, Kuwait, Qatar, Libya, Algeria, Ethiopia, Eritrea, Pakistan. The Red corner: Those tending to the Russian camp in declining order of commitment: China, Syria, Iran, Turkey. Those that are not included in other groups and, though firmly in the USA’s military zone of intervention, are current battle grounds and suffering the pains of dual government/civil war: Yemen, Somalia, Sudan. Where the plates are most contentiously rubbing is at the Russia,Turkey, Iran, Syria, Iraq, Lebanon and the Israel, Saudi Arabia, USA interfaces. Below, I will try and give a brief overview of the political landscape on a country by country basis, but only so far as each participant’s foreign policies are involved with events in Syria. A later blog, or blogs, will go into further detail on the action taking place within the landscape described. · Syria. The main battle for Syria is now over. (1.) The intervention, instigated by USA and UK intelligence agencies in 2011 to overthrow the regime of Bashir Assad, has failed. Russia, Turkey and Iran all had more to lose from a Sunni sectarian government replacing Assad’s secular government in Damascus than, in the final analysis, had the USA and Israel to gain from it. However, ground fighting persists in Idlib province to the North West, along the oil fields of the Euphrates in the Syrian/Iraqi border zone and, in the South West, along the Jordanian border. Here, Assad and Russia have just embarked on the final mopping-up of the pocket of US sponsored rebels in the Deraa region. Israeli airstrikes against Iranian operations in Syria are intermittent, but on-going throughout Syrian airspace. Bashir Assad’s aim, having succeeded in retaining power against such odds initially stacked against him, is to see his government’s control returned to all Syrian territory so that reconstruction can be funded and refugees feel safe to return. No doubt, a longer term goal would be to see the Israeli occupied Golan Heights returned to Syria, but Syria has learnt to live without the Heights since 1967. It knows that their repossession is impossible which is unlikely to happen before the melting of the ice caps and the Zionist theocracy is replaced by a less aggressive, secular regime! · What the USA wants. The USA is conflicted. President Trump’s business interests have left him indebted to the Zionist Rothschilds’ banking empire. His personal interest in re-election is likewise dependent on American Jewish funds. 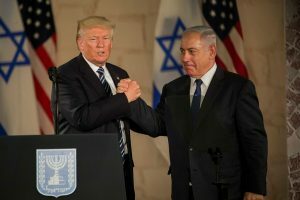 Consequently, Trump’s Syrian and Middle Eastern policies tend to coincide with those of the Israeli government. Hence the recognition of Jerusalem as the capital of Israel, Trump’s impending ‘peace’ initiative for the Palestinians and his enthusiastic support of both Israeli and neo-con ambitions for regime change in Iran. However, elsewhere in Syria, Trump’s and Israel’s policies do not coincide with those of the USA’s Russophobe military, intelligence and Foreign Service establishments. In 2011, these agencies, in accord with neo-con doctrine, had been responsible for launching the Syrian civil war. Since then, the CIA has pumped several billions of dollars into supporting rebel activities against the Assad regime, providing weaponry and air support, and paying rebel mercenary forces. Their intent had been to impose ruinous constraints on the Russian and Iranian oil/gas-based economies, with the ultimate and longer-term view of helping induce regime change in both countries. They are now loath to see their aims shunted to one side and their careers damaged by having been seen to have backed the wrong horse. This explains why one so frequently sees instances in USA Syrian policy, where the right hand (or Trump’s tweeting) seems uncoordinated with its left. Though this Washington power-struggle still remains unresolved, it would appear that it is Trump who is winning. · What Israel wants. Though initially keen on the idea of overthrowing the Assad regime, as the fighting continued, it became apparent that the American support of the rebels was almost inevitably going to lead to a sectarian government in Damascus, which could so easily turn into a troublesome jihadist opponent. Better the secular devil you know than the Islamic fanatics you don’t! In the past Israel, even after it had seized the Golan Heights, had established a reasonably comfortable modus vivendi with the Assad regimes. Furthermore, Russia was very much of the same view in regard to which regime in Damascus was the more desirable. Given the large Russian element among the Israeli population, Russia is not without significant influence – more of this in a future blog. It should be borne in mind that, in contrast to many neo-con hawks in Washington, Israel sees no benefit in and wishes to avoid any military confrontation between the USA and Russia. This is a prime concern. Trump’s increasingly apparent preparedness to override and offend the USA’s Russophobic hawks is a reflection of this key component of the ME political landscape. Israel’s major security concern is the strength of Hezbollah in Lebanon. Not only does the existence of this effective Shiite militia block Israel’s long-term, territorial ambition of gaining access to the Litani river in South Lebanon, but, far more urgently, its Iranian supplied missiles have the ability to threaten the whole of Israel’s civilian population. Thereby, they exercise an unwelcome constraint on Israel’s mistreatment of its Palestinian population and on its ability to threaten Iran with military action. Within the above framework, Israel is determined to prevent Iran establishing a permanent military presence in post-war Syria. Of equal interest is the conflict between Israel’s support for Kurdish separatism in both Iraq and Syria (and Iran) and the USA’s floundering attempts to keep Turkey bound to NATO. Overt support for the independence of Kurdish statelets along Turkey’s southern frontier is incompatible with good relations with Turkey. · What Saudi Arabia wants. Saudi Arabia’s oil fields are mainly situated on the East coast of the peninsular. By sad accident of fate, and in contrast to the almost universal Sunni persuasion of the remainder of the populace, these eastern oilfields are manned and populated by Shia. The Sunni regime traditionally discriminates against its Shia citizens, fearing (and therefore making more likely) that they should become too sympathetic to the three times more populous, Shia regime in Iran. Differences in theology and fear of economic subversion lead the regime in Riyadh to bitter enmity with Tehran and impel it to alliance with Iran’s enemies in Washington and (despite the unpopularity of such an alliance in the Arab street) with Tel Aviv. 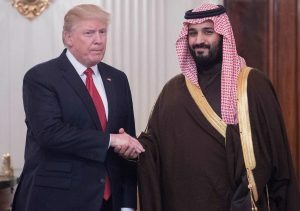 This scenario is complicated by the cooperation between and the mutual interest Saudi Arabia shares with Russia of keeping the oil price high and the pressure exercised by President Trump and his voters to keep it at a lower level. · What Russia wants. Russia’s prime interest in the Middle East is oil and gas. As described above, the neo-cons’ original aim in Syria was to find a route for a pipeline carrying Qatari gas to Western Europe. This would give Europe an alternative option whenever the USA exerted pressure to severely damage the Russian economy by cutting off European purchases of Russian gas. The Assad regime, long-time traditional ally to Russia, refused to allow the pipeline’s transit; a US installed puppet regime, clearly would have allowed such transit. There were several secondary aims behind Russian intervention on Assad’s side. Of these, the most important, with the example of the Chechen uprising still in mind, was probably its desire to deny the USA the option of using Syria as a training ground and future launching pad for Sunni terrorists into Russia’s Moslem southern territories. An incidental advantage would be the preservation of Russia’s only naval base giving direct access onto the Mediterranean. As the Syrian campaign and the USA’s blundering continued, Russia was able to develop further opportunist objectives. It is now attempting to wean Turkey out of the NATO camp. It is working to ensure that Iran remains safe for ultimate full membership of the SCO, which alliance Russia is increasingly coming to see as an essential bulwark against US encirclement. The success of its whole campaign against the USA in Syria has allowed its prestige in the ME to rise, as that of the USA has fallen. Its greatly improved relations with Israel and its cooperation with Saudi Arabia in the oil market open up other interesting possibilities for Russia’s developing ME ambitions. · What Turkey wants. Post WWII Turkey has traditionally been allied with the West. 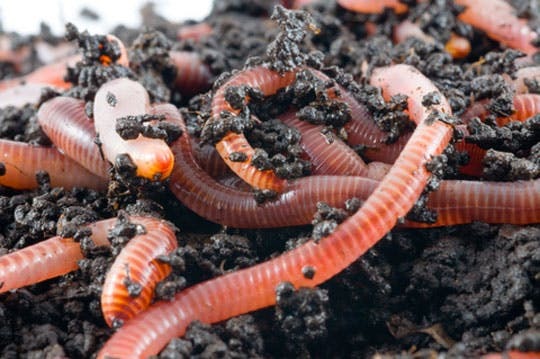 However, strains have emerged over time (e.g. the division of Cyprus.) The most significant of these has been the CIA’s giving safe haven in the USA to Fethullah Gulen, Erdogan’s bitter enemy. Then, in July 2016, the USA was seen by Erdogan as having been involved in an attempted Gülenist coup against his regime. Furthermore, Erdogan’s sympathy with the Moslem Brotherhood leads him to protest the increasing abuse of the Palestinians by Israel, which is being given full encouragement by the Trump regime. Relations have become further strained due to the USA’s reliance on Kurdish forces to suppress the ISIS rebellion in Iraq. This latter, revolting sect, having initially been encouraged by both the USA and Turkey, got out of control and has had to be suppressed. While Erdogan has been discriminating against and mistreating Turkey’s large Kurdish minority, the USA has been arming and giving military training to large numbers of Iraqi and Syrian Kurds on the Turkish border. The Kurds were under the impression that the USA’s intention was to reward them with them their own state. It was also Erdogan’s impression. As, if such a Kurdish state came into existence, it would almost certainly support the Kurdish resistance in Turkey, US policy has forced Erdogan to reassess Turkey’s western alliance. This tendency has been reinforced by the economic pull of the many Turkic peoples living to the East in the increasingly successful SCO states. 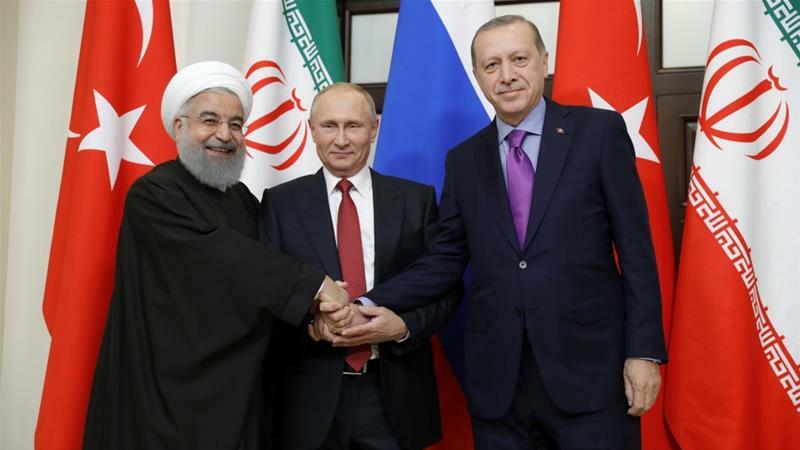 Russia has been most forward in encouraging Erdogan in his reassessment – with cooperation on both weapon procurement and in gas and nuclear power projects. Erdogan is a Sunni and by inclination a sectarian, who supports the more political and less fundamentalist Moslem Brotherhood, as against the Saudi tendency to support, openly sectarian jihadist factions. Given Assad’s Shiite culture and his secular rule, it was easy for Turkey, in the initial stages of the uprising, to support the western-backed uprising. 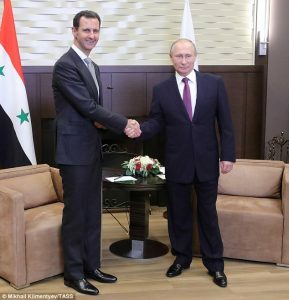 However, he and Assad came to realise they both faced the same objective in preventing any break-away Kurdish states forming on Syrian territory. Through Russian mediation, room has been found for a certain amount of cooperation between the two parties, with Russia urging the acceptance of a semi-autonomous Kurdish entity within the framework of Syrian government sovereignty. In the interim, Erdogan continues to give support to Jihadist rebels in Syria’s north western province – provided their hostility is directed against the USA supported, independence-seeking Kurds, rather than the Russian supported Syrian Army. · What Iran wants. Above all else, Iran wants to be left to develop in peace. However, ever since the overthrow of the US’s puppet Shah, American, Israeli and Saudi Arabian hostility to the new regime has been unrelenting. This hostility has already cost Iran a traumatic and bloody war with the US assisted and encouraged invading forces of Saddam Hussein’s Iraq. To defend itself against the machinations of nuclear armed Israel and its powerful allies, Iran has been encouraging and arming the Shia Hezbollah forces in Lebanon. Ostensibly, this is to help them defend themselves against the repeated Israeli assaults they have faced. However, in Iran’s eyes its primary function is to also offer a retaliatory threat to the Israeli homeland to counter any threat Israel might pose to Iran. Iran, thanks to the gross folly of the American invasion of Iraq, has achieved right of passage through Iraq en route to its Lebanese ally. After the Saddam Hussein invasion, Iran regards this continued ability to influence Iraqi politics as crucial to its national security. The destabilisation of Syria has likewise given Iran the opportunity to ally itself with the beleaguered Assad regime and thereby, complete the land supply route to Lebanon. So long as Israeli hostility to Iran remains a given, so too will Iranian support of Assad’s regime and its Lebanese Hezbollah allies. · What Iraq wants. Iraq is still occupied by the US military and has needed its assistance in ridding itself of the ISIS rebellion that the USA indirectly gave rise to (and which, in certain instances, the CIA appear to have sponsored.) Two other factors also determine the course of Iraqi politics. Firstly, a significant majority of the Iraqi population are Shia and therefore tend towards sympathy with the Shia regimes in Tehran and Damascus. Secondly, Iran has previously had the experience of having had to face and repel a US sponsored invasion from Iraq. Given these two factors Iran has both the determination and the influence to ensure that whatever regime might be established in Baghdad, it will always be forced to pay attention to Iran’s concerns. Iraq will endeavour to placate the USA by establishing as equitable a relationship with the Saudis as possible. However, irrespective of whatever the CIA or Pentagon might desire, together with Ankara, Tehran, and Damascus, Baghdad will oppose secession by Kurdish breakaways. It will also be favourably inclined to Iranian attempts to offer support to the Shia regime in Damascus and to Hezbollah, its Lebanese Shia ally. · What Jordan wants. Jordan’s King spends his life tight-rope walking. More than half his population are Palestinian refugees from past Israeli clearances His Kingdom has no economy worth talking about and is heavily reliant on hand-outs from the UAE and Saudi money-bags. As his survival is largely dependent on US and Israel continuing to find it convenient, he has been forced to support the rebels in Syria by offering training facilities and safe haven. His reward has been to be forced to host about 1.4 million Syrian refuges. These, impose an oppressive economic and political burden on his regime. Jordan desperately requires an end to the Syrian civil war and above all else, a peaceful settlement to Israel’s conflict with the Palestinians. The first wish is on the verge of fulfillment. The second wish is most unlikely to be happily resolved, as King Abdullah II’s kingdom is probably ear-marked by the Israelis as a longer-term destination for much of its remaining Palestinian population, when the time comes for the next round of ethnic cleansing. Presidents Xi and Putin – to whom the last laugh? · What China wants. 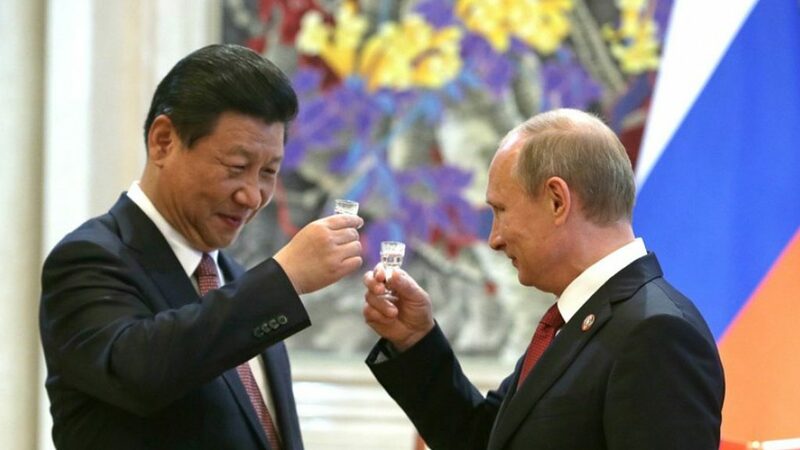 China wants Russian success in Syria. The Islamic terrorists to be trained in Syria, were as much intended for the destabilisation of the western provinces of China as for its increasingly close ally, Russia. Of much greater import to China is the stability of the Middle East in general. In marked contrast to the USA, China is heavily reliant on oil purchases from Iran and the Arabian Peninsula. A conflict between Iran and Saudi Arabia would inflict major damage on the Chinese economy. It would also impede the steady extension of the One Belt, One Road project on which its break-out from US attempts at containment and so much more of China’s future ambition is predicated. When one looks at the amazing number of lives lost and destroyed and at the enormous destruction and wasted expenditure of capital that these squabbles of anachronistic sovereign states have brought about, one cannot help feeling that humanity is in the most desperate need of a more sensible way of ordering its affairs. At the centre of this mess is the American – Israeli alliance in which both partners, with their ideologies of exceptionalism and pillage, are striving as best they can to invalidate the concept of international law. Barring any unexpected intervening excitements, the next blog will look at the Russian/Turkish/Israeli/USA/Iranian interaction. This entry was posted in Global Governance, Middle East, West v East and tagged Iranian foreign policy, Iranian Israeli policy, Iraqi foreign policy, Jordanian foreign policy, Middle East foreign policies, Russia Middle East policy, Saudi foreign policy, Syrian foreign policy, Trump Rotschild connection. Summitry – consummate and inconsummate.